As a food blogger I am always trying new things and different recipes. But somedays it is just nice to make a batch of fresh chocolate chip cookies. 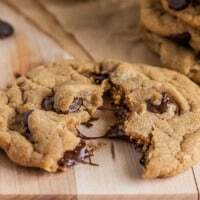 There is nothing better than a gooey chewy warm out of the oven chocolate chip cookie. And I think this may have just been the best out there. Brown butter just makes every cookie recipe better. While we were all sneaking some of the cookie dough, my little 5 year old said, Mom! This is the best caramel chocolate chip cookie dough that you have made! I had never thought of describing brown butter as a caramel type flavor. But it kind of is! It gives it a caramelly, nutty flavor that is to die for! I think that this might just be the best cookie recipe that I have tried! I like when cookie recipes stay soft and chewy after you bake them for days after. They were perfect! I know that you will love them too! 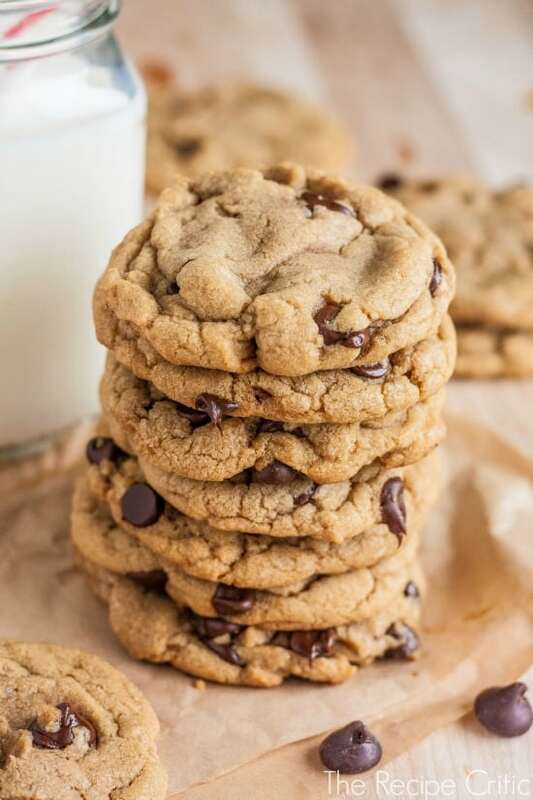 Perfect chocolate chip cookies are made even better with brown butter! Preheat oven to 350 degrees. Cut the butter in pieces and place in a saucepan over medium heat. Whisking frequently allow the butter to brown. Remove from heat and let cool to room temperature. In your mixer, combine sugars and brown butter. Blend until smooth. Add the egg, egg yolk, vanilla, and yogurt. Next, mix in the dry ingredients. Fold in the chocolate chips until incorporated. Cover and chill in the refrigerator for 30 minutes. On a non-stick baking sheet, or lined with parchment paper, scoop the dough out by tablespoons about 2 inches apart. Bake until golden brown in the preheated oven for 10-12 minutes. WOW, those sound yummy!! Nothing best a warm Chocolate chip cookie. By far the BEST chocolate chip cookies I have ever made! I host youth group at my home every tuesday night and provide dinner and dessert. 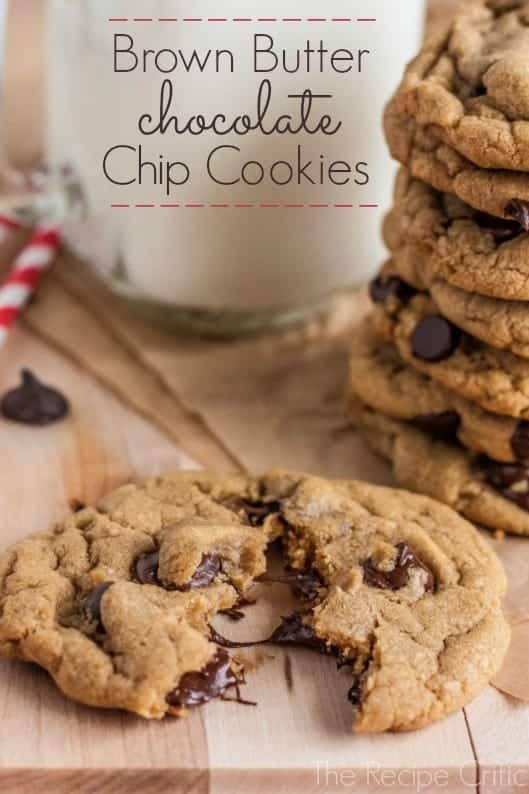 I’ve made a number of your recipes for teens and these cookies were by far at the top of the list! My sister compared thought they were the Nieman Marcus cookie recipe but these are better and so much easier to make!!! Seriously, nothing beats a classic chocolate chip cookie. These look incredibly soft and chewy! I have not tried brown butter in any cookies yet…I’m sure I’m missing out! What an amazing cookie Alyssa! And yes, brown butter is the BOMB! I love love love brown butter in baked goods. These cookies look awesome!!! So do you strain the sediment from the bottom of brown butter or use it all? Mmmm I love soft and chewy cookies too!! I will definitely try these out soon! I have made these a few times now. They are my favorite! These cookies are to die for. The only problem I had is that they didn’t flatten out/spread into what your picture shows. They stayed as mounds/hills. Any suggestions would be greatly appreciated. Thanks so much for the receipe. We made them today and they are delicious!! I am making these today! I just took my 1st batch of these out of the oven and they are amazing! I have never used brwon butter before so I did strain out the particles, but now I know for next time that it’s not necessary. And there will be a next time soon! Thanks so much for sharing your recipe! OMG! These are the best chocolate chip cookies that I have ever made. The outer edge has the perfect amount of crispiness without being dry or tough and the rest of the cookie is moist and chewy. The brown butter gives them a toffee flavor that is rich and delicious I live at high altitude (5300 ft) and did not alter the recipe at all. Pure perfection. i love browned butter cookies. There is a recipe on Food52 that is excellent and Alton Brown’s is wonderful as well. I am trying yours today with a few modifications. I had doubled your recipe and found the dough to be a bit “runny” so I added another 1/2 cup of flour. Since I like chewier, cakey cookies, I used Alton’s advise and used half bread flour. Instead of bagged semi-sweet chocolate chips, I used semi-sweet bars and broke them into uneven pieces. Then added some broken up pretzel pieces. The real secret to the best tasting, chewiest, perfectly browned cookies is refrigerating them, preferably overnight but at least 4 hours. Your cookies, though, look amazing! Can you add weights as well as the volumes? Also, is the brown sugar packed?